Every big city in the world has its special quarters, areas where birds of one nation’s feathers flock together, whole streets where all the shops and restaurants are strangely similar (and yet strangely alien to the surrounding streets), serving just one national community. In London, if you want Greek and Turkish stuff, you head to Haringey; if you’re looking for Indian culture then Southall’s the place; and if you want Arabia, then it’s all on the Edgware Road. Arabs have been settling in London since the end of the 19th century, but the process accelerated in the 1950s, 70s and 80s following various wars and political routs. Why they chose to colonise the Edgware Road is not entirely clear, but it only takes one or two successful businesses to prompt a whole load more to jump on the bandwagon (this is a very Middle Eastern trait: if you run a busy shop, before too long you can guarantee your compatriot will come and open something more or less identical next door). The first time we delivered to our wholesale customers in this little patch of Central London, I was, frankly, gobsmacked (this does not happen very often). It was mid-Summer, when the population of the area more than doubles, as extended families of Arabs from Saudi, the Emirates and to a lesser extent the Levant, rent apartments and come to enjoy the best that the West End has to offer. Every shop featured (neon-lit) bi-lingual signs, and the pavements were heaving with promenading Arabs in full national dress. Armani-clad boy racers revved impotently in the heavy London traffic, hoping to attract the attention of, well, anyone really. Brightly lit restaurants replete with fountains and gold chandeliers rejoiced in exotic names such as Maroush IV or Ranoush XXV. In the shop windows bling jostled with technology and swanky health preparations. The air was thick with the fruity smell of shishe smoke, the waft of too much expensive perfume, and the aroma of shawarma kebabs turning in the windows of the many, many takeaway joints. It really did feel as if we had left London, especially when later I witnessed a group of five ladies in full hijab haggling with the cashier at Woolworths. Tell you what: if you haven’t visited it before, or are coming to London soon, the Edgware Road is well worth a detour – and it is certainly the best place to sample some of Snackistan’s finest. 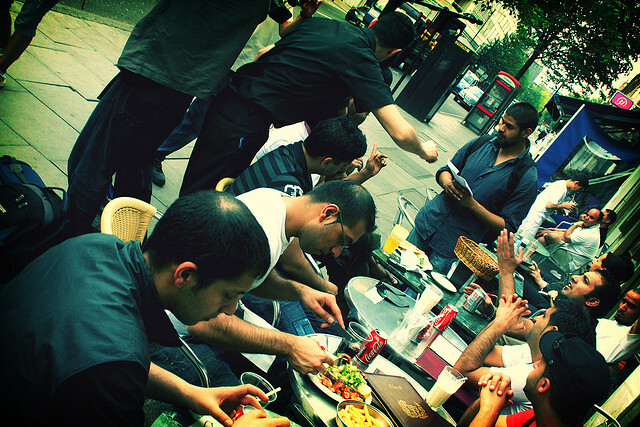 With a bit of luck and a following wind we are hoping to organise a Snackistan street food walking tour based on the Edgware Road later on this Autumn – watch this space! Photo sourced under the Creative Commons Licence on Flickr: image taken by timmiles2007. This entry was posted in Postcards from Snackistan and tagged Arabshire, Edgware Road, street food walks on September 18, 2013 by Sally Butcher. Is there still Woolworth’s in Edward Road?